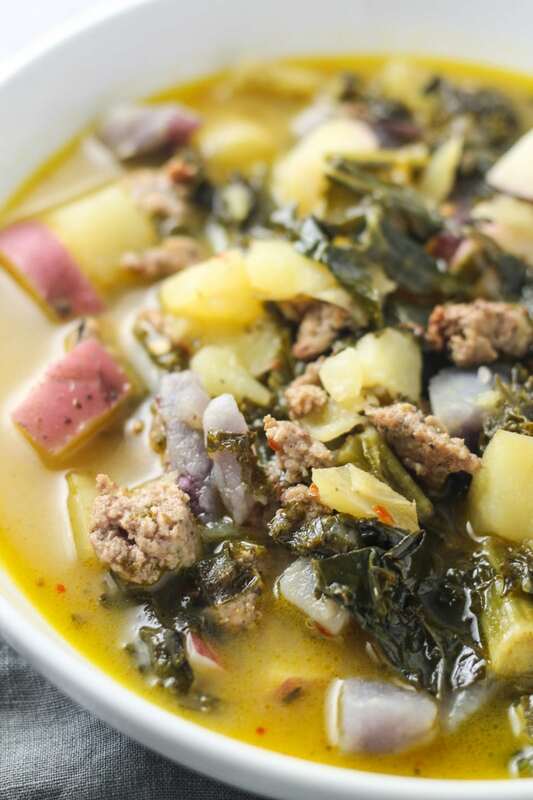 Warm up with a bowl of delicious Low FODMAP Kale, Potato, and Sausage Soup! Not only is this recipe veggie-filled, but it’s also gluten and dairy free! Many store-bought broths contain high FODMAP ingredients like onion or garlic. So, I usually like to make my own instead. We have roasted chicken on a near-weekly basis. So, I often have bones available to make my own low FODMAP chicken broth. It may sound like a lot of work but it’s really easy to make in the crockpot! With that said, I do like to keep a couple of pre-made options on hand just in case I can’t make my own. 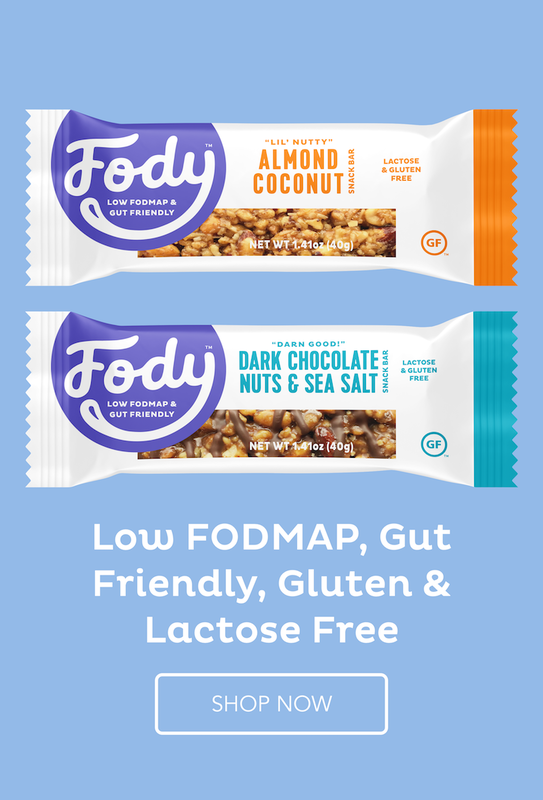 The two store-bought low FODMAP options that I have found, and try to keep on hand, are FODY’s Low FODMAP Chicken Soup Base and Whole Food’s 365 Brand Organic Chicken Broth. If you go the Whole Foods route, double check the ingredients, because not all of their broths are FODMAP-friendly (by ingredient). I have not been able to find any kind of pre-made FODMAP-friendly sausage. Every commercially-made sausage that I’ve looked at contains either garlic or onion. So, I make my own. 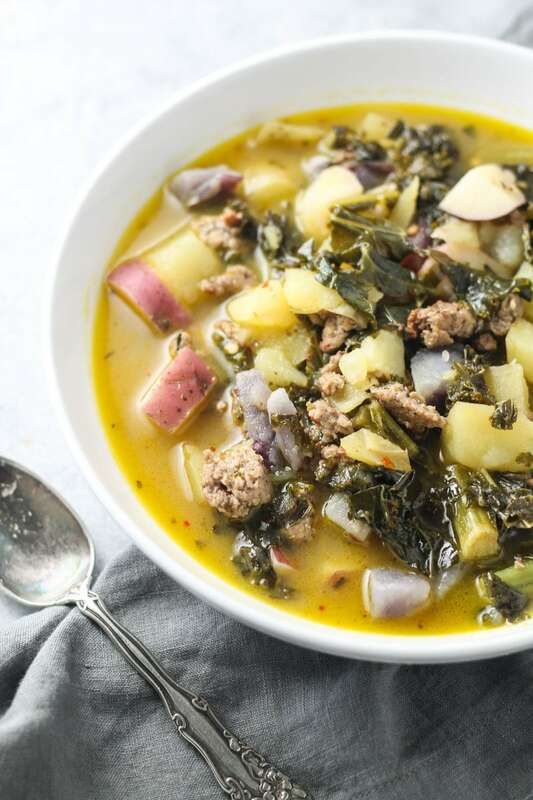 My low FODMAP breakfast sausage recipe makes about two pounds and this soup recipe calls for one pound of breakfast sausage. So, I like to make a complete batch of breakfast sausage, divide it in half BEFORE cooking, and then cook each half separately. One half will turn into breakfast sausage patties and the other half will be browned into crumbles for this soup. Heat olive oil in a large pot over medium heat. Once hot, add sausage and brown until cooked throughout. Add chicken broth and potatoes. Bring to a boil; then reduce heat and simmer until potatoes are tender about 15 minutes. Stir in kale and red pepper flakes; cook until kale is wilted. Season to taste with salt and pepper. Top with chives and enjoy! Thank you so much for sharing, Lucette! 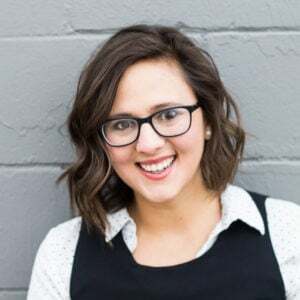 I DO love to travel (even with IBS) and I am really excited to hear that you are interested in topics like that. I’m adding them to my list of future blog post ideas. Thanks again and hope you have a great start to your week! 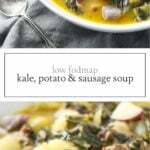 I loved this soup recipe! Every soup I find has onion or garlic so this was such a welcome surprise! And it was delicious! I do wonder about Kale though, is that one to kind of limit? Overall my husband has been pretty good with the soup. Also I love the sausage recipe! It’s so nice to make my own sausage and not have all the preservatives, salt, garlic and onion that they all seem to have! YAY for tasty and healthy! That’s fantastic, Erin! Thanks for taking the time to share!! Is breakfast sausage safe? I assumed the seasonings would include onion and/or garlic. I read labels but usually see “spices”. Do you recommend a certain brand?